Today’s title is based on an “enlightening” conversation I was having with my 8-year-old grandson. At dinner the other night, he was seated next to me and was “talking story” with his old Papa. In between chews of his dinner bun, he began talking about his favorite superheroes. By the time the sampler platter arrived, he had begun to focus on a particularly interesting superhero – the Red Lantern. I shared that as a kid, my favorite superhero happened to be the Green Lantern, but I had never heard of the Red Lantern. Upon discovering that we shared an interest in the powerful lanterns, protectors of the universe, I made a quick inquiry on my smartphone and located his Red Lantern…along with a whole bunch of other lanterns – where had these all come from? It was upsetting my understanding of the DC universe! 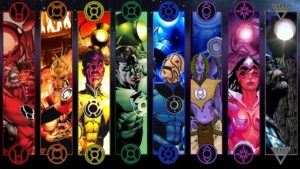 The Green Lantern Corps was a large group of space law enforcement officers, each one responsible for a sector of the galaxy. They were like marshals or Jedi, patrolling assigned sectors of the galaxy. I liked the lanterns because their power (emanating from their rings that were recharged by a lantern) was only limited by their minds and wills. I was able to inform my grandson that my favorite Green Lantern (Hal Jordan) was actually the 1960’s DC comics reboot of the original 1940’s Green Lantern who used a ring powered by magic. By the 1960’s, the ring and lantern were technological wonders that harnessed and magnified willpower. In checking out the Red Lantern, we were to discover that in the modern DC universe, there are now a multitude of different Lantern Corps beyond the Green: the Orange Lanterns, the Blue Lanterns, the Yellow Lanterns, the Blue Lanterns, the Indigo, the Violet, the Black, the White…and likely more to come in the future. I had only been aware of my old favorite, the Green Lantern Corps – how my fictional universe has changed! Ironically, in the real world of Karate, the process of speciation has been gradually working on my favorite martial art. In the “old days” (just over a hundred years ago) Te, the predecessor to modern Karate, was limited to Okinawa and practiced by certain members of the old Ryukyuan gentry class. Serious students might visit several masters over the years, to increase their knowledge of the relatively secret art of Te. Over centuries, the art developed through such exchange between students, masters, and the influence of Chinese martial arts on the native Ryukyuan art. Back then, there weren’t large dojos like in the modern sense. Training was done in secret with the master and a handful (or less) of vetted and very earnest students. Each master was teaching a system based upon what his master(s) had taught him and his own unique experiences and insights. There were no major, highly organized ryu or “styles” like there are in modern karate. In Japan, the major styles that emerged were: Wado-Ryu, Goju-Ryu, Shito-Ryu, and our own Shotokan. Karate didn’t make it to Japan until around 1922 (less than a hundred years ago) where it would be transformed to align with the Japanese Budo systems. Previously in Okinawa, this type of organizing didn’t happen although what the masters taught had gradually coalesced into regional variations of Te associated with the towns of Naha, Shuri and Tomari. Like the evolution of the fictional lantern corps, modern karate is comprised of a multitude of different styles, Japanese, Okinawan, and Korean. When writer Bill Finger created the original Green Lantern, I’ll bet he never imagined that some 80 years later, it would develop, expand, and continue to thrill young readers all over the world. My grandson is fortunate that he did. When Master Gichin Funakoshi took that fateful boat ride to the main islands of Japan in 1922, the art of Te was still limited to a small group of practitioners on the island of Okinawa. He was on a mission to share and spread the art with the hope of preserving it. I’ll bet he never imagined that a century later, it would develop, expand, and be practiced by millions around the world. We’re fortunate that he and other like-minded masters devoted their entire lives to the effort.